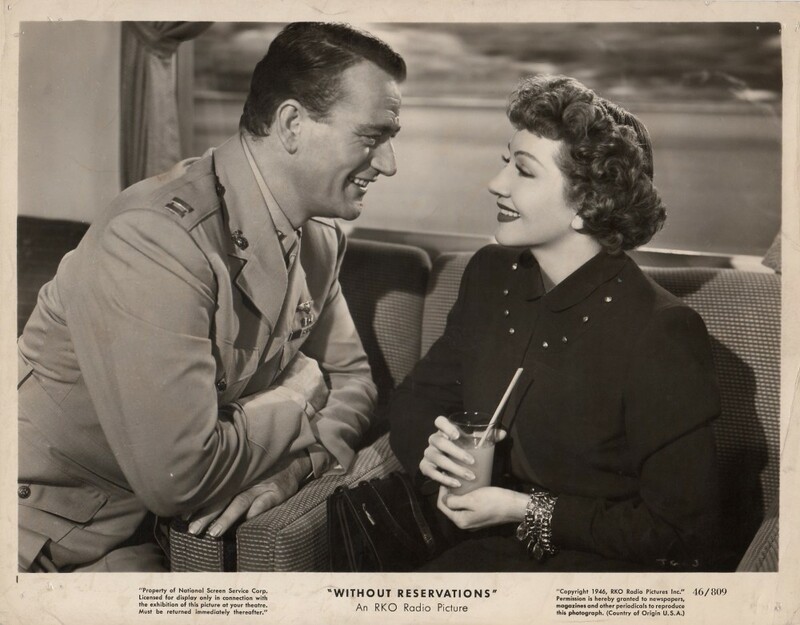 John Wayne, Claudette Colbert, Marine Flyers, a female best-selling author, good old American values. I love love love this movie! I know you will, too! Christopher “Kit” Madden (Claudette Colbert) is a post-WWII breakout young female author who has written a best-selling novel that has swept the nation. In the form of a passionate love story, she calls for a total remaking of the “American Way,” and the masses are eating it up. So much so that the rights to her book have been bought by Hollywood. Kit is on her way to California to help the studio cast her main character. On her train, she is seated next to two Marine pilots, Rusty (John Wayne) and Dink (Don DeFore). After visiting with Rusty for all of five minutes, she’s convinced that he should play the lead in her movie. However, after she has already contacted the studio and promised to bring him for a screen test, she finds out Rusty despises her book. He thinks the main character is a wimp and the message is unpatriotic. Undeterred, Kit lies about her identity and resolves to change Rusty’s ideology on the course of their trip. It might have something to do with that fact that he’s, well, John Wayne in his prime. Thus begins their kooky cross-country train trip together. Over time, Kit starts to fall for Rusty, even though she’s frustrated that her attempts to engage him in political conversations tend to leave her without answers to his (flirtatious) challenges. As their romance blooms through zany adventures, Kit forgets to consider how Rusty might react when he finds out she’s been lying to him about who she really is. Will he really want to leave a career in the Marines for a career in Hollywood? Will he understand that she felt she had good reason to pretend to be somebody else for days on end? Will he believe her when she says she really loves him and wasn’t just trying to coerce him to be in her movie with her womanly wiles? There is so much about this movie I love. John Wayne never gets fair dues for his comedic skills, in my opinion. And Claudette Colbert is one of my favorites, an actress more than capable of holding a movie with two male leads. I also love the unashamed patriotism that so many 40s movies had. And the romance between Kit and Rusty is very believable, if a bit dated. 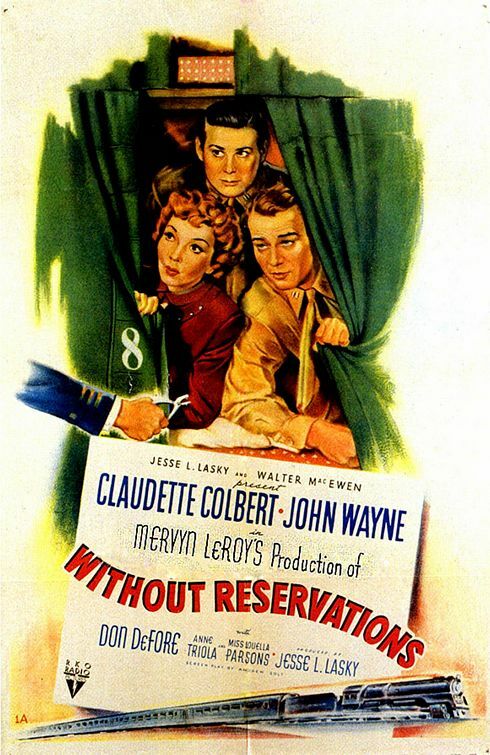 “Without Reservations” will be on TCM on Thursday, Sept 13 at 1:30 pm CST.